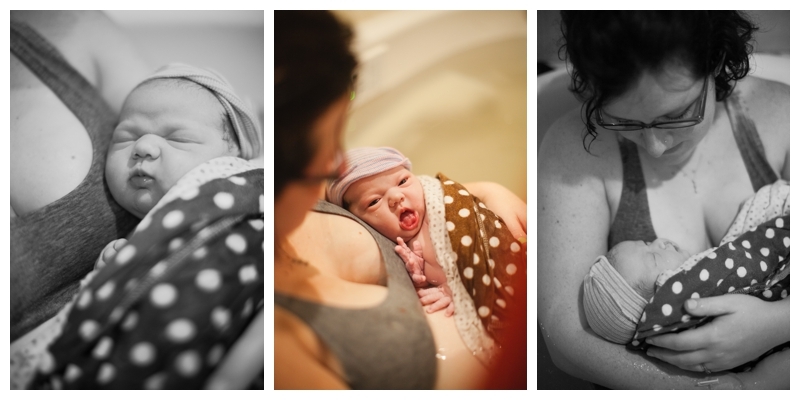 The birth of baby Olivia Rose at Health Foundations Birth Center as captured by Twin Cities Birth Photographer Megan Crown. Everyone always says that you’ll know a contraction when you have one, but for the first hour or so I wasn’t sure that I was in labor. I told my partner, Dylan, to start timing the squeezes to see if there was a pattern. Sure enough, each squeeze lasted about 40 seconds and they were coming about four or five minutes apart. Labor! We called the midwife to let her know what was happening. 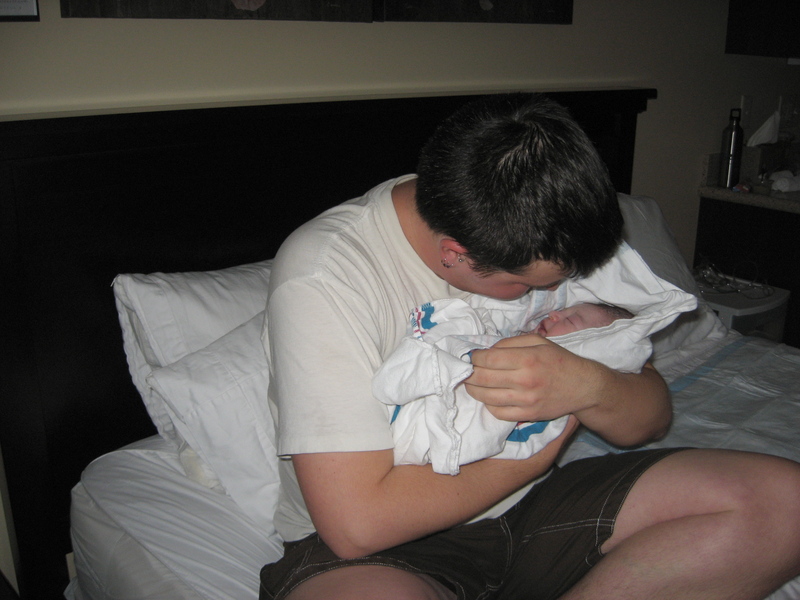 She encouraged us to labor at home for as long as possible. “Call me back in a few hours,” she said. I took a warm bath and tried to nibble on snacks and drink water. The contractions were getting more persistent and requiring more focus. I rolled on an exercise ball for a while, listened to Abbey Road on vinyl, but the thing that helped the most was to hold on to the back of one of our dining room chairs while swaying my hips and gently stepping my feet. I let my whole spine undulate during contractions while trying to relax as much as possible. By midnight I was sure that labor had progressed enough to go to the birth center. The midwife asked to talk to me during a contraction, which was not easy but I could do it. She confidently said that I was not ready to come in yet and that I should try to labor at home a little longer. However, I was getting concerned that if we waited too much longer the 20 minute car ride to the birth center would be extremely uncomfortable. She encouraged me to take another warm bath and meet her at the center in two hours. Although I had been anxious about the car ride, my contractions actually slowed way down on the drive over. By the time I waddled into the birthing suit in my jammies and slippers, my contractions were much more manageable than they had been at home. Even so, I was confident that I was at least four or five centimeters dilated. I had heard so many women say that they too were confident about their progress only to find that they had not dilated at all, but I was certain I was not one of them. The midwife asked how dilated I had been that afternoon. “About two,” I replied, “How far am I now?” The midwife maintained a cool composure and said, “You’re making nice progress and you have some work left ahead of you.” I laughed, “No really, how far am I?” She just reiterated that I was doing great and that I should keep up the good work. I was able to translate her evasive language myself: I was pretty much exactly where I was that afternoon. 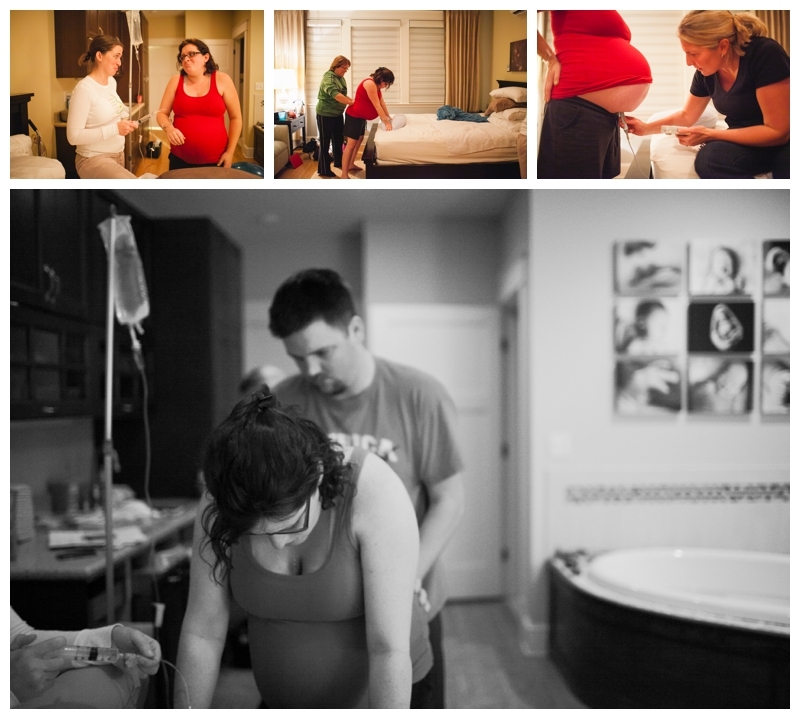 Although the contractions were getting intense, I remember being able to quietly talk with my doula during the breaks. I had known ahead of time that I didn’t want a lot of talking or noise during labor, but in this warm, cozy room with just the two of us, our soft whispers were so comforting. My midwife came and checked on me periodically. I was laboring fine and Baby was doing well. Thus far in labor I had almost exclusively been upright, either standing or kneeling. Lying down, even being on my hands and knees or draped over something, was not comfortable. The midwife got concerned that with so many hours of being on my feet I was going to get tired. She asked me if I felt I could lie down to try and get some rest. Rest? Was she kidding? I humored her and gave it a try, but just as the first contraction set in I jumped up and started my swaying dance. No way was that going to work. The contractions got stronger and I became more introspective. The talking in between contractions stopped. The nurse and my doula encouraged me to try and eat something. Food sounded revolting, but I remembered from our birthing class that eating and drinking during labor were important. I forced myself to swallow a bite of applesauce, and somewhat defiantly shoved the spoon back into the bowl as if to say, “There, I ate. Are you happy? Now stop bothering me.” I remember the nurse chuckling and saying that one bite wasn’t going to cut it. I think I later stomached a fruit popsicle which seemed to satisfy the masses. Some time later the midwife was back and strongly suggested that I try to get off my feet for a bit. I understood why she wanted me to rest–I needed to have enough energy to keep laboring at the birth center and to be able to push later–but I really didn’t think I could do it. However, I remembered hearing about women who eventually needed to be transferred to a hospital for an epidural and a break because they were exhausted. The one place I didn’t want to end up was the hospital, so off to the bed I waddled. The second my contractions started in that bed I started to cry. I squeezed my eyes tight and started to fight each contraction. For the first time in my labor I started saying “Ow,” and “I can’t do this.” I silently cursed at the midwife for making me lay down. I felt lost. Then, my wonderful nurse took both of my hands and ordered me to open my eyes. She looked straight at me and said, in a calm but firm voice, “This is your birth. You get to decide how you do this.” I remember feeing like the words could mean anything, but her look said everything. She was helping me find my way back. She was telling me to work with my body, not fight against it. I sniffled, nodded my head, and took a deep breath. The next contraction came, and I let it. I breathed, and I let it happen. And then, I kid you not, I fell asleep. My contractions slowed down and I remember waking up in a dream-like state for each of them. I would make sounds, move, or even sit up during a contraction, and then I’d drift back off to sleep. My partner told me later that he and the doula marveled in disbelief at the sleeping woman in labor. I tried to rally. I gathered my strength and went on laboring. By now my contractions were becoming relentless. There was little and sometimes no break in between contractions. I stood under the hot spray of water in the shower for what seemed like eternity. I gripped the support bars with all of my might while I swayed back and forth under the water. Talking was long gone. I didn’t talk and everyone around me knew not to talk either. I started making small, sometimes completely unrecognizable hand gestures to communicate. I mimicked drinking from a cup when I was thirsty, I shook my head almost imperceptibly when someone asked me a question, and I held up one finger when I wanted people to wait while I was having a contraction. If someone reached out to touch me during a contraction, up went my finger. It said, “back off, I’m busy.” If someone tried to take my vitals and I felt a contraction coming on there was the finger again saying, “hold on a second, don’t touch me.” My partner and doula deserve so much credit for being able to give me what I needed during this phase. I wasn’t speaking or letting anyone touch me and yet I still felt completely supported and cared for. 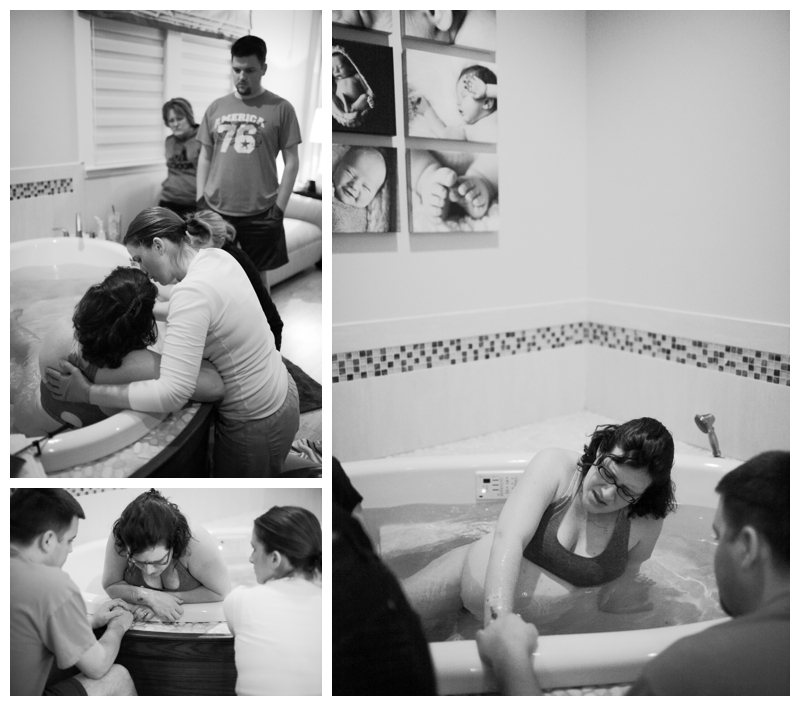 As the contractions got even more intense I found myself dismayed by how relentless the process was becoming. I couldn’t call for a time out and my body didn’t listen when I wanted a break. I felt like I was a servant to the process. I kept talking to myself, reminding myself to stay open, visualizing how the contractions squeezed from the top while pulling the cervix open at the bottom, but I started to surrender to the knowledge of my body. I took solace in knowing that I didn’t actually have to do anything; my body was doing it for me. I could help or I could hinder, but this baby was coming. We learned many comfort measures in our birth class, but as I felt my body changing during labor I instinctually found my own comforting rituals. For a while I had the urge to push against something with my head. Somehow pushing with the top of my spine helped me free up the bottom of my spine and I was able to sink into more relaxation. Dylan’s chest was the lucky recipient of my pushing head. At the start of the contraction I would find Dylan, grab him by the arms and pull him toward me. I would push him up against a wall and then sink my head into his chest and twist it back and forth as my lower body swayed and swung. I also started to do more sounding in this phase of labor. I had the urge to make a lot of “mmm” sounds, but I remembered our birthing instructors words: “open mouth, open sphincter.” I tried my hardest to turn every “mmm” into a “mmmaaah.” I also started talking to the baby. 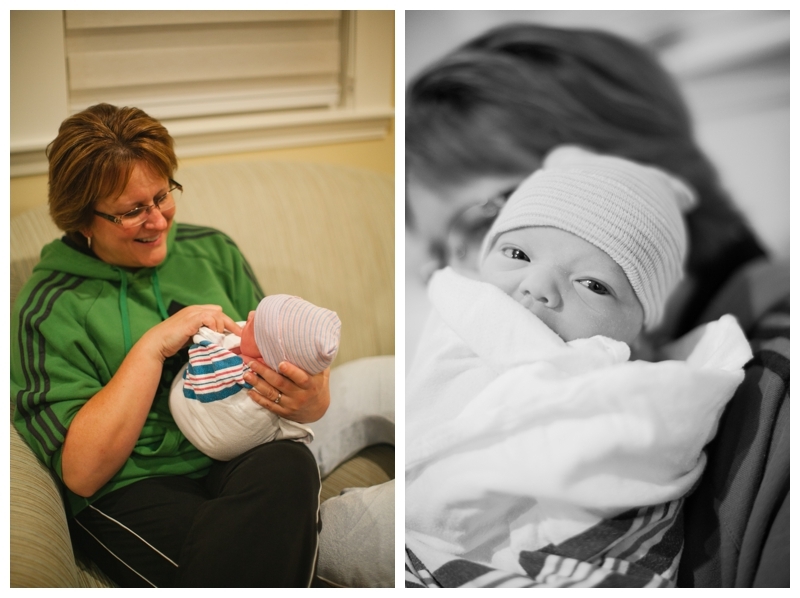 During particularly hard contractions I would mumble, “it’s okay, it’s okay…” over and over. My partner and doula knew I was talking to the baby, but at one point the midwife came in and seemed to be concerned. “It is okay,” she affirmed. I wanted to tell her “no, I know that I’m fine, I just want the baby to know he or she is fine.” This felt like my first real motherly act: the baby was going through this stressful and arduous process with me and I felt responsible to help the baby stay calm and to reassure him or her that everything was going to be okay. And somehow, putting the needs of the baby before my own made the contractions more bearable. The hours kept passing and the contractions got overwhelming. At one point I said, “I don’t know if I can do this any more.” Even as I said the words I knew they weren’t true. I knew I could keep going, I just needed some reassurance that everything I was doing–all the movements, moans, and grunts–were normal and okay. Later I learned that when my doula went to get the midwife and told her what I had said, the midwife simply nodded, stood up, and calmly walked into the birthing suite. This was just a phase that most women went through. She crept into the bathroom where I was laboring and said just enough calm, reaffirming words to help me continue. I was fine; this was what labor was supposed to be like. It was so much harder than I thought anything could be, but it was normal and that knowledge was comforting. As my contractions got even stronger and the baby got even lower, I decided to try sitting on the toilet. I had read that many women found that to be a comfortable place to labor and I was going to take any iota of comfort I could find. Now, I didn’t just sit on the toilet, I laid on the toilet. I went as horizontal as one could get while still sitting on a toilet. My head rested on the wall behind me and my feet were out in front of me as far as they could stretch. 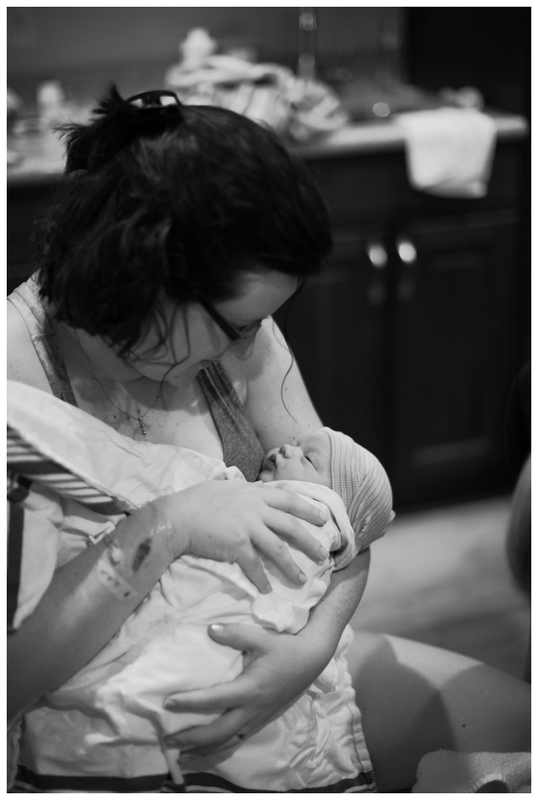 During each contraction I grabbed Dylan’s hand and pulled back as hard as I could having him counter my weight. (He told me later that his thumb had turned purple but good man that he is, he didn’t complain once.) The toilet became my labor station for some time. If there was a contraction, I needed to be on that toilet and in my pulling-on-Dylan position. At one point in the early morning the midwife suggested that she check me once again. I tried to get up and walk to the bed but as the next contraction started I literally ran back to the bathroom to have the contraction on the toilet. It was the fastest I had moved in months. I tried again to make it to the bed so that the midwife could check on my progress. I made it just outside the bathroom door before another contraction hit. I remember grabbing Dylan and pressing my weight into his body while thinking “if there were drugs here, I would take them.” But then I thought, “If I really want drugs, I’m going to have to put clothes on and get into a car. No way in hell I’m getting into a car. I’ll be fine.” That was the only moment that drugs crossed my mind and I am forever grateful that they weren’t available and that no one offered me any. I understand why people take them, but I was really committed to a natural birth and I am so thankful to have been a facility that encouraged and supported that choice. During the most intense hour of labor I remembered another bit of wisdom from our birth educator: “When you feel like you can’t do it anymore, it’s probably the transition phase, and you’re probably almost done.” I told myself that as I got back into bed to get checked a third time. While I had no sense of time, I could see the sun streaming in through the window. I smelled coffee brewing. I had labored through an entire night. I felt a little surge of power. I had made it at least twelve hours. Then my midwife looked down and smiled at me, “Now I’ll tell you your progress: you’re at nine centimeters.” Nine! I really was almost done. That little surge of power turned into a wave, a tsunami of confidence. I went back to the toilet for the final lap of labor. I started to feel unbelievable pressure getting lower and lower. With each contraction I felt more and more like I was sitting on a bowling ball. I just couldn’t believe that I could labor much more without this kid falling out. I muttered “I think I might be ready to push.” The midwives had a shift change in the morning, so the new midwife who had taken over filled the birthing tub. 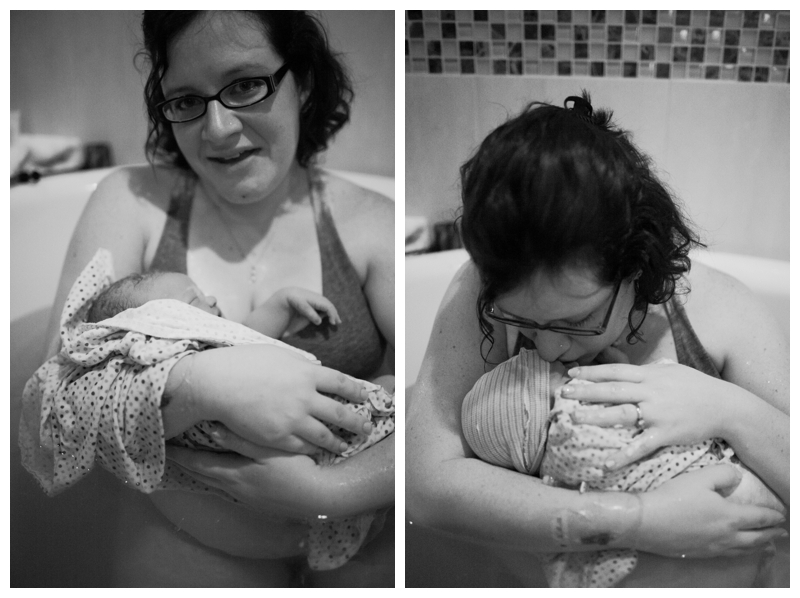 My doula, my partner, the nurse, and I made a small processional to the tub. I realized this was really happening. My dream of having a baby was about to come true. Suddenly the once quiet, almost empty room was all abuzz. It was still incredibly calm, but it had a sense of aliveness. My mother came in and sat quietly in the corner. The nurses prepared instruments and post-birth equipment. Dylan slipped away quickly to put on his swim trunks in case I wanted his support in the tub with me. 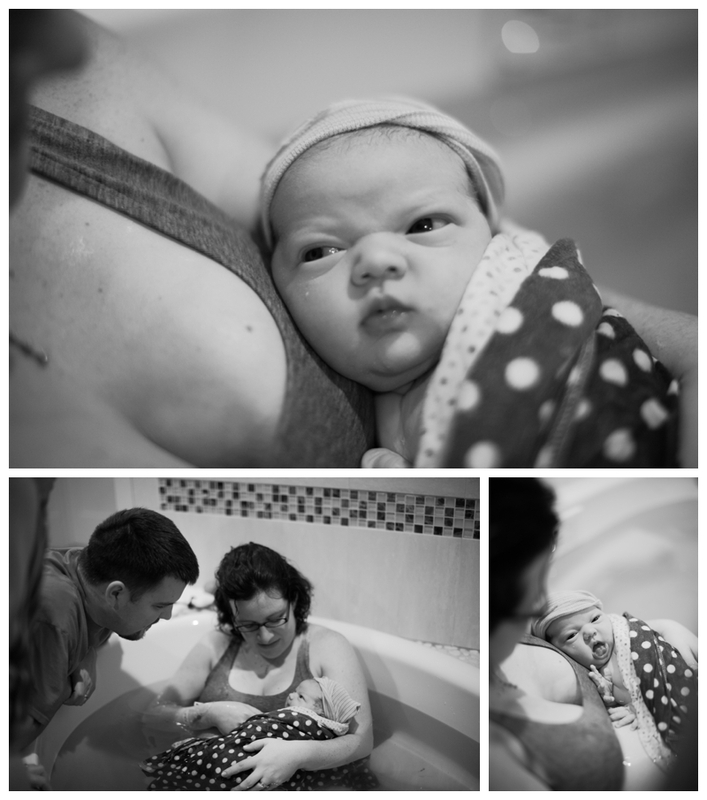 The midwife helped me into the tub and to get comfortable. Everyone was in their places ready for the show to begin. I wasn’t sure that I truly had the urge to push but once the midwife gave me the okay I gave a little test push during my next contraction. With that little test push my body surged into a strong push. It was a lot like throwing up in reverse: the second you start to push it just takes over your whole body and you can’t help but push. 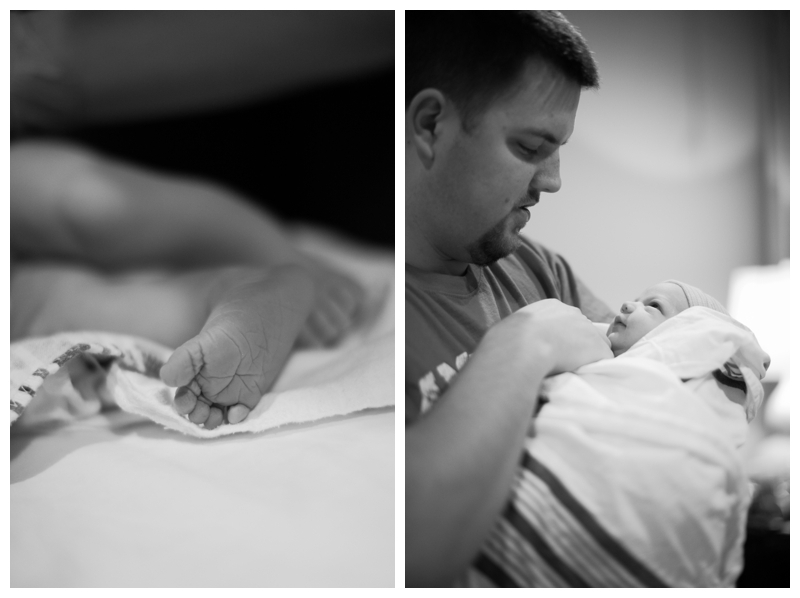 I gave a few strong pushes and the midwife told me to reach down to see if I could feel anything. When I did I was astonished to have felt a tiny, quarter-sized bit of soft, squishy, wrinkled baby head. I remember exhaling, looking up, feeling the sun shine on my face, and smiling. 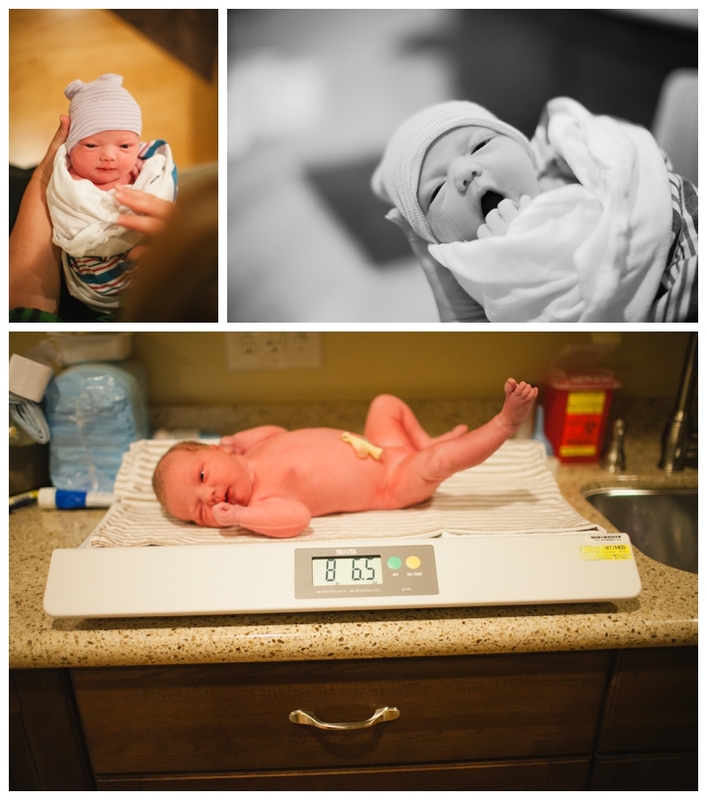 Norah was born at 10:30 in the morning, weighing six pounds, ten ounces, and measuring 18 1/2 inches long. After Norah got some vigorous rubs and puffs of air, she started to pink up. We got out of the tub and delivered the placenta. Once the cord had stopped pulsing, Dylan clipped the cord. Our family of three made it to the bed to cuddle. We tried nursing, but Baby wasn’t super interested yet. I was so in awe of this beautiful baby that I was completely unaware of the nurse and midwife monitoring Norah closely. Not long after we got snuggled into bed the midwife told us that Norah wasn’t breathing well enough on her own. If she didn’t get the hang of it soon, she’d have to go to the hospital. 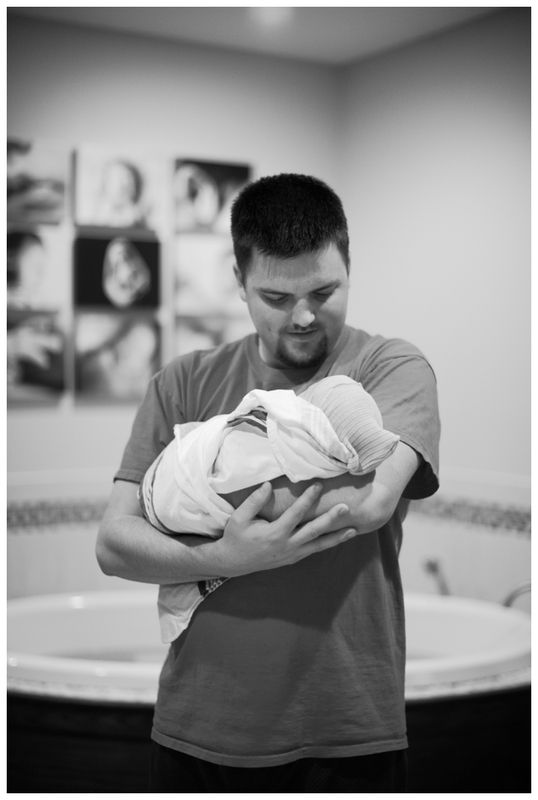 While I was worried and disappointed at the idea, I remember feeling like “we made it through all of the labor and delivery. If this is what we need to do, it’s what we need to do.” The happy post-birth hormones were wonderful. Norah did end up being transferred to the hospital. My partner went with her and spent several hours in the NICU holding her and telling her all about the family she had just joined. I stayed at the birth center to get cleaned up and to rest. My pulse rate was really high for hours after the birth so I too was transferred to the hospital. 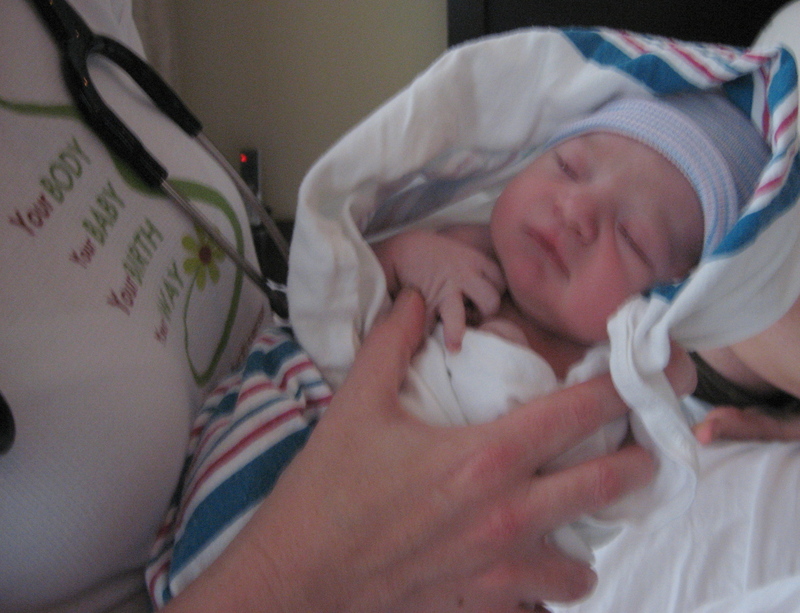 I had great nurses at the hospital who let me sleep in the baby’s room in the NICU. One nurse even came to me in the middle of the night to take my vitals so that I wouldn’t have to leave Norah. I spent the night nursing and cuddling my new, perfect little baby. Although I was sad about being transferred to the hospital and especially about missing those several hours with Norah after birth, I’m glad that our midwife did what was best for us. Neither of us needed any medical intervention aside from monitoring, and we were sent home the next day. I am forever grateful that we were able to birth the baby at the birth center and not in a hospital, but I am also thankful that we were taken to the hospital when we needed it. It will always be a somewhat bittersweet ending to our birth story, but luckily it is just the start of our lifetime with Baby Norah. I am so grateful for the amazing and empowering birth experience we had. Sometimes when I’m sitting and nursing Norah I start to daydream about her birth, about pushing her out, and about seeing her for the first time. It is the single most amazing experience of my life so far. The fact that I birthed a baby makes me feel fierce. It makes me feel like I can be a good parent, because if I am strong enough to birth a baby, I am strong enough to face anything that life sends my way.